Welcome, friends, family, alumni, and prospective families! First, if we have not yet met, allow me to introduce myself. 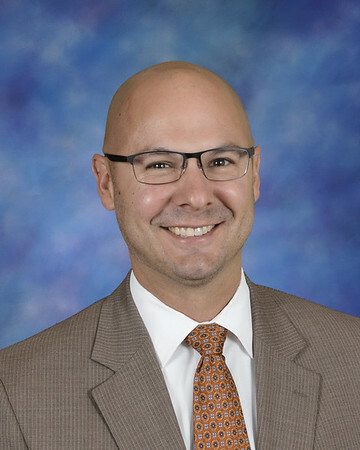 I am Adam Ferguson, and I began as Principal of St. Michael Parish School in Fall 2017. I couldn’t have imagined how great it would be here at St. Mike’s. The students, our staff, the community…it has just been amazing. I thank everyone for the warm embrace as Principal, and thank God for bringing me here to serve. As your Principal, whether you’re a current family, you’re considering St. Michael as an option for your family for the future, you were once a school family and now your kids have grown, or you’re an alumnus yourself, please know I invite you to talk with me about the school, share your experiences, ask questions, and please… come visit! We have two annual events that may interest you if you are a visitor: our Catholic Schools Week Open House and our Blue & Gold Gala. I personally invite you to stop in to visit our all-school Open House on January 27th at 1pm, following Noon Mass. As well, we hope you are free on the night of February 15th, and join us for the Annual Blue and Gold Gala! I hope to see you soon! We offer year-round tours, so if you simply call our office, our staff can arrange for a visit at your convenience. By way of an update, I am excited to share with you a wonderful happening... we launched a "Stand Strong" initiative for school safety last Spring. Stand Strong began as a movement within our community to better secure the school; safety being top priority. The major outcome of the campaign was an overhaul of our front entry, as shown in the rendering below. In addition to many safety upgrades, we will have a new traffic pattern into the school and better use of office space. This is incredibly exciting and we are deeply grateful to the community's response to this critical building project. A heartfelt "thank you," to all who contributed! If you are visiting our website because you are considering St. Michael for your family, I invite you to please contact us and visit. School days really are "different" here at St. Michael. Your child will experience such incredible gro wth during the school years and we hope you will consider that St. Michael provides a uniquely formational school experience. Through our community culture, engagement in faith, teaching of morality and virtue-centered living, and a common language that values goodness, students at St. Michael build a self-view and world-view that are positive, hopeful, and life-giving. I am honored to partner with all our school families as we continue the rich tradition of academic excellence and Catholic-based education for which St. Michael Parish School has been well-known in our community.